Designed for outdoor applications 20ft to 80ft high. Adapts to most outdoor lighting requirements for larger areas. Waterproof and designed to withstand extremes in environmental temperatures. Requires rigid pole mount and can be mounted as a single unit or in multiple arrays. 3000K to 6500K. Energy savings as high as 80%. Intelligent dimming for even more energy savings. The BioSmart 90-150W LED outdoor bay light is designed for industrial or commercial applications where reliability and performance are important while budget is the other important aspect. Every component of the BioSmart 90-150W LED outdoor bay light has been carefully engineered to provide reliable performance and bring across many benefits of utilizing solid state lighting technology in commercial applications. 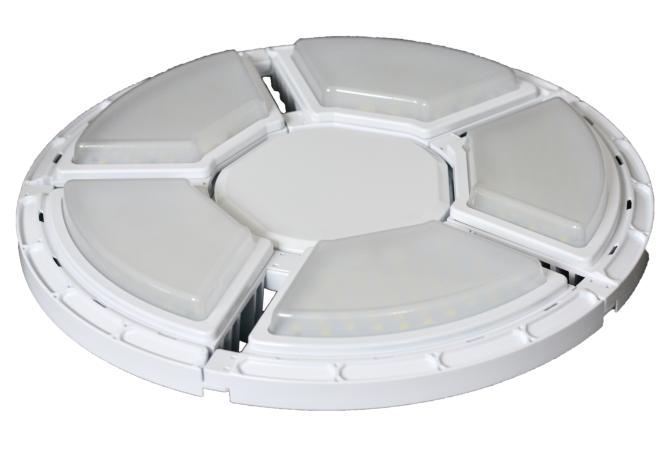 BioSmart 90-150W LED outdoor bay light is CE and RoHS compliant. LED outdoor bay lights replace metal halide lamps or Mercury lamps for various applications in factories and warehouses. Higher than 100 lm/W, adopted high quality LED light source, far above metal halide lamp efficiency. 60,000h lifespan is 4 times that of traditional metal halide lamp, reducing maintenance times and costs. Uses only 90 watts compared to 250 watts for metal halide lamps for similar lumen output. The LED Bay light is easy to dim using intelligent diming controls.